Watch the Secret Wars Live Kickoff This Tuesday 1/20! This May, time has run out and Secret Wars, the landmark 8-issue event, is ready to shake the very foundations of the Marvel Universe as you know it. But first, on Tuesday, January 20th 2015 at 3 p.m. Eastern, Marvel is hosting the ground breaking Secret Wars LIVE KICKOFF! Streaming live from New York City’s own Midtown Comics next week, fans can head to Marvel.com/secretwars to get their very first Secret Wars info straight from Marvel’s Editor-in-Chief Axel Alonso and SVP, Executive Editor Tom Brevoort! Prepare for the coming of a new Battleworld and learn the first details of the strange, patchwork realm playing host to countless separate realities! The road to the biggest comic event of the year has begun, and you will not want to miss the first Earth shattering revelations that will have everyone talking! What will happen when Time Runs Out? What secrets does Battleworld hold? Tune in on 1/20 for the answers to those questions and more. A unique collaboration with Midtown Comics, the Secret Wars LIVE KICKOFF can be viewed on Marvel.com/secretwars at 3 p.m. EST on Tuesday, 1/20/2015. 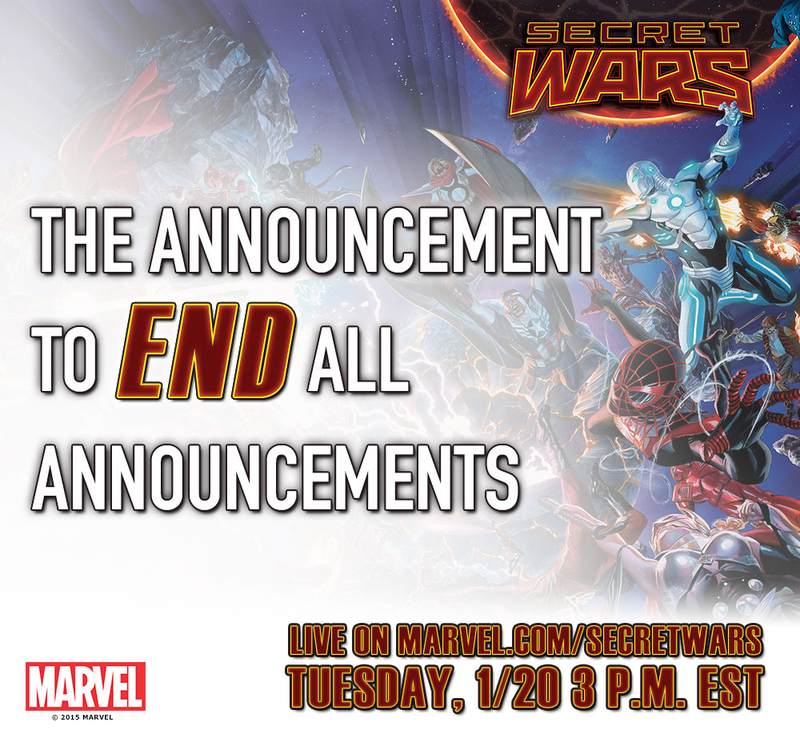 For more details, keep your eyes peeled to Marvel.com and join in the conversation on social media using the hashtag #SecretWars. Welcome Home Star Wars With Epic Launch Parties in January! Marvel is kicking off 2015 with a bang big enough to destroy a Death Star as Star Wars makes its triumphant return to the House of Ideas and into comic shops on January 14th! 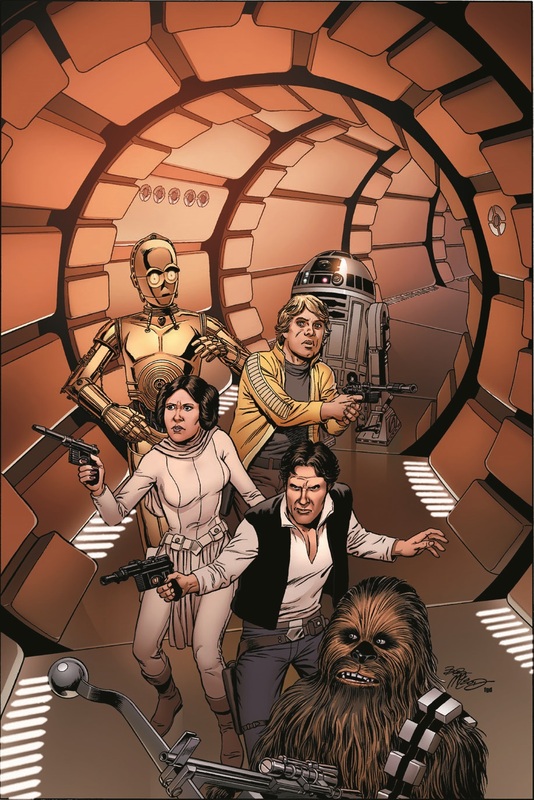 That’s right, your local comic shop is the place to be to get your hands on the blockbuster first issue of Star Wars! In addition to being among the first to purchase and read the landmark Star Wars #1, fans will also be able to receive special items exclusive to these launch parties. 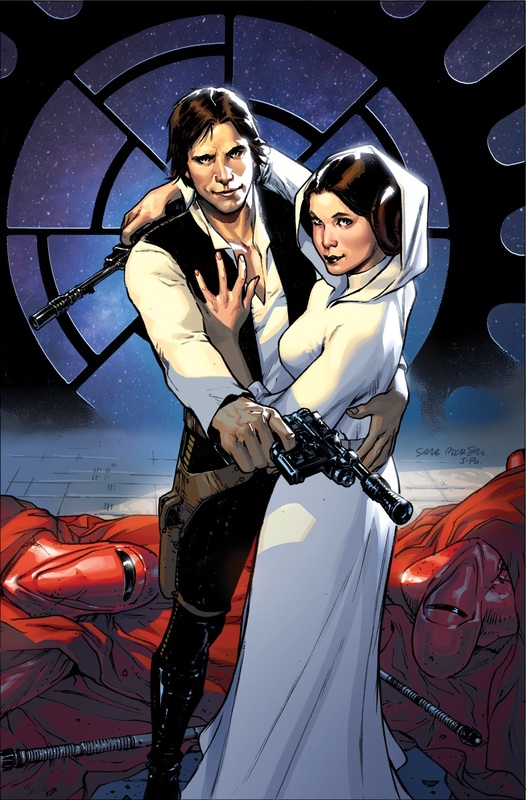 Star Wars #1 is already poised to be one of the biggest launches of the year, and Marvel is making sure comic book stores worldwide are armed and ready for the landmark return of Star Wars to its home at Marvel. 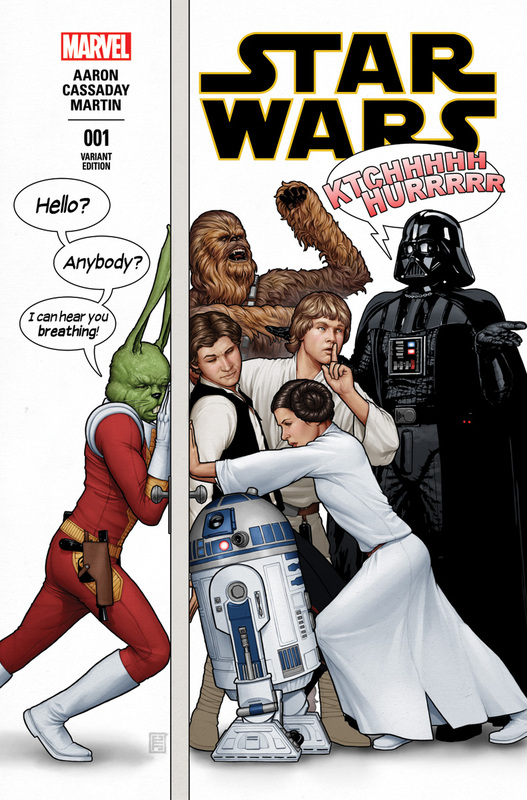 Each retailer opting into the Star Wars #1 Launch Party will receive a Star Wars Party Kit from Marvel, containing exclusive promotional materials including exclusive variants, promotional buttons, cake toppers and more. Check your Marvel Mailer for more information on how to opt-in by 12/08 to ensure your store has these promo items and exclusives. This January, take your first step into a larger world as a galaxy far, far away returns to Marvel with Star Wars #1 – on sale January 14th! Marvel Announces Avengers & X-Men: AXIS #1 Launch Parties! Marvel’s next big event Avengers & X-Men: AXIS launches October 8th and the publisher is putting together packages including special items exclusive to launch parties are retail stores. To ensure these parties are the biggest sales success of 2014, each retailer opting into the event will receive a Avengers & X-Men: AXIS Party Kit from Marvel, containing exclusive promotional materials. Stores should check their Marvel Mailer for more information on how to opt-in by 9/1 to ensure tjheir store has these AXIS promo items and exclusives. Promotion of parties to Marvel fan base via Marvel.com, Twitter and Facebook. But that’s not all! Retailers who qualify will also be eligible to order the Avengers & X-Men: AXIS #1 Deadpool Party Variant. From rising star Chip Zdarsky, take a humorous look at the events of Avengers & X-Men: AXIS through the eyes of Deadpool in this hilarious cover spoof. This one-of-a-kind variant you can only get at the launch parties should not be missed! Shmaltz Brewery in Clifton Park, NY will host a fundraiser birthday party on Thursday, August 28th, 2014 to celebrate the late Jack “The King” Kirby’s birthday. Kirby is considered by many to be the co-creator (along with Stan Lee) of the Marvel Comics Universe. Kirby co-created many of the superheroes being adored by fans of Marvel’s recent blockbuster movies, including the Avengers, the Hulk, Captain America, Thor, the Fantastic Four and many more. A group of local comic professionals approached Shmaltz about doing an event, with proceeds to be donated in Jack Kirby’s honor to Hero Initiative, a non-profit organization that helps comic creators in need. 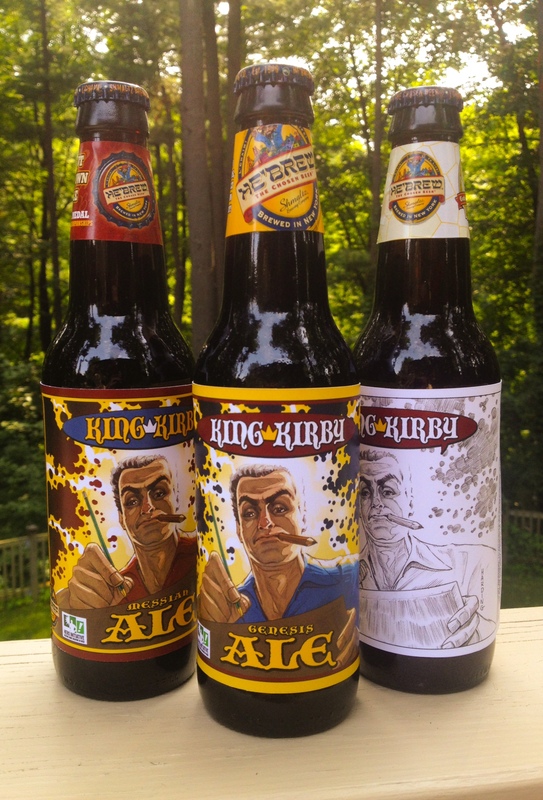 Shmaltz stepped up in a big way, creating a limited-edition, Kirby-labeled ale exclusively for the party. 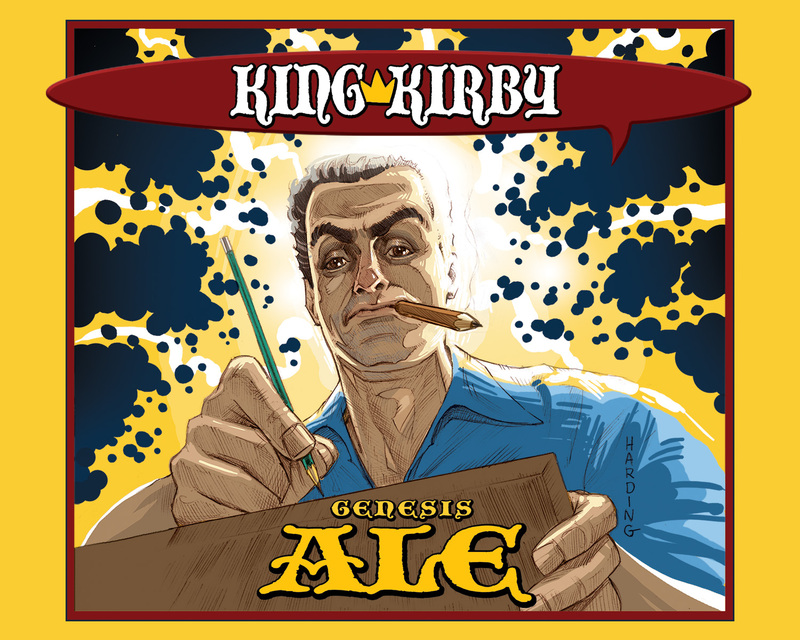 King Kirby Ale will make its debut at the event, and a limited number of cases will be available for purchase. With a special edition label designed and drawn by Clifton Park artist Paul Harding, the ale will be available in both Pale and Dark varieties. The Aug. 28 event will run from 4 to 8 p.m., and feature an impressive array of comic professionals, including Green Lantern and Silver Surfer writer Ron Marz, sculptor Paul Harding, X-Men artist Tom Raney, Conan and Spider-Man writer Fred Van Lente, writer Crystal Skillman and many others, who will be signing and sketching for donations to Hero Initiative. Van Lente and Skillman are the co-authors of the recent play “King Kirby,” about Jack Kirby’s life, which enjoyed a successful, well-reviewed run in New York City. Fans attending the party will be able to get autographs and sketches from the comic pros, and enjoy a beer tasting as well as a piece of special Jack Kirby birthday cake. Live music will be provided by Saratoga-based rock ensemble Sugar Pill, led by John Stack on guitar and vocals. Party tickets are $20, with proceeds donated to Hero Initiative. Door prizes have been donated by Comic Depot of Saratoga Springs, and Excellent Adventures Comics of Ballston Spa. Titan Comics Declares July 26 Doctor Who Comics Day! This July 23 sees the release of two brand-new Doctor Who ongoing series, Doctor Who: The Tenth Doctor and Doctor Who: The Eleventh Doctor by Titan Comics, which already is set to be the biggest Doctor Who comics launch in recent times! To celebrate Titan Comics is pleased to announce Saturday July 26 will be Doctor Who Comics Day and would like to invite Doctor Who fans and comic readers to join in with the celebrations. As well as being the first to read these exciting two new series, Doctor Who Comics Day will give fans the chance to celebrate everything Doctor Who with signings, events, special variant covers and promotions in stores and at shows in the U.S.A, Canada, U.K. Australia and New Zealand! Full details will be released next week. For one week the entire city of New York will become a playground for super heroes, villains, vampires, zombies, geeks and passionate fans of all sizes. With different pop culture themed experiences happening in every corner of the City – including concerts, comedy shows, gaming events, lectures, podcasts, storytelling, food tastings and more – New York Super Week is an immersive and inclusive experience that aims to bring the energy, passion and color of the entire universe of popular culture to every corner of all five boroughs of New York City. Clear Channel Spectacolor has been announced as the Official Media Partner of New York Super Week and New York Comic Con in 2014 and will co-produce several New York Super Week events. ReedPOP has partnered with a number of venues, bars, restaurants and retailers throughout the city, including, but not limited to: Hammerstein Ballroom, 92nd Street Y, Rock Bar, The Bell House, Galapagos Art Space and Barcade. New York Super Week will be the ultimate celebration for fans of pop culture. Kicking-off with StarTalk Live! hosted by Dr. Neil deGrasse Tyson at the Hammerstein Ballroom, New York Super Week events will demonstrate the breadth of international, national and local pop culture, ranging from live recordings of Ask Me Another and Slate’s Hang Up & Listen podcast, to The Big Quiz Thing, Running Late with Scott Rogowsky featuring the co-creators of Dr. Katz, Story Collider, and eSports competitions. Additional partners, on sale dates and details about purchasing tickets for each of the New York Super Week events will be continually announced throughout Summer 2014. Tickets for individual New York Super Week events a New York Super Week Card will be available for purchase starting on June 18 and will offer cardholders access to discounts and special offers happening during New York Super Week at dozens of retailers, restaurants and bars across the city ranging from happy hour prices, free desserts, and merchandise discounts to priority seating for select New York Super Week events. With Free Comic Book Day 2014 this upcoming weekend, Valiant is proud to announce that 45 retailers nationwide have signed on to produce exclusive promotional covers for Valiant’s biggest FCBD release ever – the FCBD 2014 Armor Hunters Special! Available in participating stores everywhere on May 3rd, 2014, Valiant’s FCBD 2014 Armor Hunters Special is the perfect place to jump on the board the crossover event of the summer with a special, advance look inside June’s Armor Hunters #1 (of 4) by creators Robert Venditti and Doug Braithwaite. When Aric of Dacia returned to Earth with the stolen X-O Manowar armor of an alien race, he thought he finally found a weapon to guard the peace and kingdom he’d struggled so long to secure. But now, a relentless and surgical strike team from the farthest reaches of space – sworn to exterminate the armor and all like it – have found their final target. The ARMOR HUNTERS are coming. They will hunt. They will trap. They will kill. And they will rid the universe of the X-O Manowar’s incalculable destructive power…even if it means taking the Earth with it. Also arriving on Free Comic Book Day, don’t miss the the FCBD 2014 Valiant Universe Handbook – a first-of-its-kind handbook release detailing the untold origins and secrets of Valiant’s heroes and villains, all in one place! Everything you need to know about the Valiant Universe in 2014 and beyond can be found right here in the first official Valiant Handbook release…ever! Featuring artwork from a “murderer’s row” of comic’s brightest talents – Doug Braithwaite, Clayton Crain, Clayton Henry, Bryan Hitch, Esad Ribic, and many, many more! An EPIC SCAM? Nope…It’s Two Free Comic Book Day TITLES from ComixTRIBE! This Free Comic Book Day, publisher ComixTribe will be releasing two books. The event is held this upcoming Saturday, May 3, 2014. This year, ComixTribe is bringing you SCAM #0: Crosswords, a stand-alone story that spins directly out of the events of Joe Mulvey’s recently concluded SCAM mini-series. The issue is written by Eisner-nominated scribe Jason Ciaramella, and also features a back-up story from John Lees and Alex Cormack. In addition to the hard-hitting SCAM release, ComixTribe is also offering the 32-page pilot issue of EPIC, a new superteen action comedy from Tyler James, with art by Matt Zolman and Fico Ossio. Spinning out of the pages of the super-powered con-man series, Scam, Eisner-nominated writer Jason Ciaramella (The Cape) and “the most dangerous man in comics” Joe Mulvey bring you an explosive one-shot featuring Scam’s ultimate villain: Crosswords! After being exiled from “Sin City”, Crosswords makes a power grab in Europe, using extreme means to take what he wants! 32pgs, FC Rated: TEEN+ FREE! After a freak experiment gives teenager Eric Ardor incredible powers, he does what anyone would do… he puts on a costume and becomes Epic! Super strength, speed, flight, optic blasts… it’s a fanboy’s dream come true. Unfortunately, he’s just discovered he has one weakness… pretty girls! And while most boys his age lose their cool around the hotties, Epic loses his powers! 32pgs, FC Rated: EVERYONE FREE! Red Giant Offers 4 Books on Free Comic Book Day! Red Giant is offering four books this upcoming annual Free Comic Book Day, on May 3, 2014. Powered by free comic book giveaways, the annual event has become an extremely popular initiative that drives traffic to retail comic book stores while introducing new audiences and readers to comicbook properties. This event marks the premier of their Giant-Size line in the form of “zero” issues. All four books will be bundled together, helping insure readers have equal access to the entire line. Wayward Sons – The spin-off to the legendary Webcomic series, this series follows the adult children of beings who were once worshipped as Gods. Tesla – At the turn of the century, Nikola Tesla and his trusty side-kick, Mark Twain, join forces to battle the Illuminati, led by the nefarious Thomas Edison! Duel Identity – The world’s greatest superhero is actually the world’s greatest assassin. Pandora’s Blog – When a young girl moves to a new town, she blogs about the strange things she sees, and gets some unwanted attention as a result. Magika – A young boy discovers a magical world filled with strange mystical creatures who come into our world through a mound in his grandparents’ backyard. The First Daughter – The President’s daughter learns her destiny when she is pulled into a secret, supernatural enclave beneath the White House. Darchon – Enter a dark world of supernatural threats that can only be handled by one man – but is he what he claims to be? Shadow Children – Children are brought to another realm, where they acquire supernatural powers and become members in an army of darkness. The Giant-Size line, scheduled to launch July 2014 as an on-going weekly event from Red Giant, which will produce 1 million free books every Wednesday, to help build traffic and readership for the industry. Red Giant not only benefits from the advertising revenue this venture generates, but also the awareness it builds for its properties and a stronger, healthier marketplace for the entire comics industry.